A classic aircraft design still in service more than fifty years after the first version flew, the Boeing B-52 is a heavy bomber operated by the United States Air Force. The official "name" of Stratofortress has never been widely used; perhaps the most common name for it in the military is BUFF, an abbreviation for Big Ugly Fat Fellow. The final model, B-52H, and the only one in service, is expected to stay in active service until at least 2040. The B-52 celebrated its 50th anniversary (first flight April 1952) in April 2002 and is the longest serving combat aircraft in the world - a total of 744 were built. Bombers had advanced rapidly in the Second World War, with the Boeing B-17 the mainstay of the offensive against Germany, and the B-29 against Japan. Both with the coming need to carry large nuclear weapons and have intercontinental range, requirements for a successor were being defined even during the war. While the B-36 was an interim attempt, it was a World War II design. While the B-36 was approaching production, a new requirement was issued, in late 1945, for a bomber with an operational radius of at least 5,000mi/8,050 km, and greater speed than the B-52. Initial Boeing proposals first were essentially a scaled-up B-29 with turboprops, first a straight-wing design and then a swept-wing turboprop reminiscent of the subsequent Soviet Tu-95 BEAR. By 1947, these still did not appeal to the Air Force, and the XB-52 project, also being pressured by the Northrop XB-49, a "flying wing" reminiscent of the much later B-2 Spirit. It was made clear that the winning design would have to be pure turbojet. Eventually, Boeing was awarded a proposal in 1951, for 13 B-52A aircraft. An XB-52 and a YB-52 prototypes were already under construction. Only 3 A models were actually built, and served as test aircraft. The contract called for the aircraft to be convertible between a B-52 bomber and an RB-52 configuration. The B-52A first flew in 1954. A total of 744 B-52s were built with the last, a B-52H, delivered in October 1962. The B model entered service in 1955. In 1956, a B-52 dropped a live Mark 15 thermonuclear bomb of 4MT yield over Bikini Atoll. The bomb detonated 30 seconds early, bending but not breaking the drop aircraft and other aircraft in the test. As Goebel put it, this "was fortunate as bailing out was not an option under the circumstances." Other drops were done until the Atmospheric Test Ban Treaty went into effect in 1963. In 1957, a flight of three B-52Bs, with air refueling, circumnavigated the planet in 45 hours and 19 minutes. Together with the demonstrated nuclear delivery capability, the force clearly demonstrated global reach in nuclear warfare. B-52Cs and Ds had only minor modifications, the main changes being in the fuel system. The D model also dropped support of the reconnaissance pod; where the U.S. continued to specialize, the Soviet Union built even more Tu-95 and Tu-142 BEAR variants as maritime patrol/antisubmarine warfare, signals intelligence and maritime strike surveillance. In U.S. service, these missions went to transport aircraft derivatives such as the P-3 Orion and RC-135 RIVET JOINT. Originally intended to fly high and fast to targets in the Soviet Union, improvements in the Soviet integrated air defense system made such a flight path suicidal, except when firing long-range air-to-surface missiles. In the nuclear delivery role, the aircraft was mechanically strengthened and given penetration flight paths at extremely low altitude. The next major modification was the E model, whose changes reflected the new tactic of low-level penetration of the Soviet Union, their high-altitude defenses having become too formidable. Soviet air defenses had improved to the point where high-altitude bombing was no longer practical, and so SAC switched to low-level tactics. This required new navigation and bombing avionics. The F model was essentially an E model with improved engines. G models, of which 193 were built, had performance improvements including weight reductions while increasing fuel tank size. Wing pylons were added for the AGM-28 Hound Dog cruise missile. Doctrine for this missile focused on using it as a penetration aid, to take out air defenses on the way to the targets to be attacked with gravity bombs. At one point, the G was seen as the last model, with the B-52 to be replaced by the supersonic B-70 Valkyrie high-altitude bomber. Development problems, coupled with the serious question if high-altitude penetration was possible at any speed, resulted in the cancellation of the B-70 and commitment to the B-52H. B-70 cancellation caused significant friction with the United Kingdom, since it led to cancellation of the associated Skybolt high-performance cruise missile program. The British had expected to use the Skybolt on their own strategic bombers. Only the H model is still in the Air Force inventory and is assigned to Air Combat Command and the Air Force Reserves. The first of 102 B-52H's was delivered to Strategic Air Command in May 1961. The H model can carry up to 20 AGM-86 ALCM air launched cruise missiles. In addition, it can carry the conventional cruise missile that was launched in several contingencies during the 1990s, starting with Iraq and ending in the Balkans. The B-52H entered service in 1961 and 104 were built. The last was delivered in 1962. However, due to extensive system and structural upgrades, its service life is expected to continue beyond the year 2040. Air refueling gives them worldwide range. Present flexible force, primarily for support of ground troops and for missions with conventional weapons, but retaining a nuclear attack capability with cruise missiles. Strategic delivery of nuclear bombs would use the B-2 Spirit stealth aircraft, which can penetrate integrated air defense systems. At this time, the standard weapon load was one or two "clips" containing either B28 gravity bombs or dedicated penetration aids. In the 1960s, the more powerful B41 and B53 bombs were added, as well as the 10 KT tactical B57 bomb. Also in the sixties, a number of steps were taken to shorten takeoff time, such as pyrotechnic engine starters (essentially large blank shotgun shells) rather than auxiliary power carts. The "minimum interval take off" (MITO) procedure, where a large force would take off, nose to tail like a herd of elephants, a collision always imminent in the dense smoke they produced. In the Strategic Air Command, the alert system required 70-80 hour weeks on duty, with constant drills and draconian discipline. At any time, a senior general might fly in, without warning, and hold an Operational Readiness Exercise (ORE); that general could promote or demote on the spot, or even dismiss wing commanders. There was ever-present realization of what it would mean if the alert was ever real; the crews might survive, but their bases, homes, and families were apt to be radioactive dust. The most intense airborne alert was during the Cuban Missile Crisis. 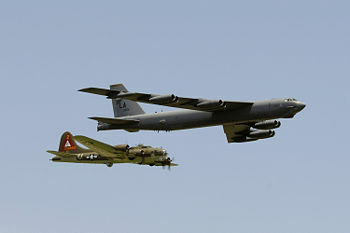 The B-52 proved sufficiently reliable that the Air Force began to phase out B-47 medium jet bombers. B-47 range, even with air refueling. was shorter than that of the B-52, requiring politically sensitive forward bases outside the U.S. In addition, the smaller B-47 did not have the space to add the ever-increasing amount of electronic warfare systems. There had been some hope for the supersonic B-58 medium bomber, but that proved hard to fly and unreliable. Still in the strategic role, the Single Integrated Operational Plan (SIOP) role of the B-52 evolved, given the increasing availability of missiles for fixed targets. In addition to the ability of manned bombers to strike mobile or contingency targets, they could send a deadly warning that missiles could not. If more bombers went onto airborne alert, as they did in the Cuban Missile Crisis, or flew closer to the Soviet Union, it was a threat that simply could not be transmitted by a missile crew moving their hands closer to the launch key. A U.S. Air Force Boeing B-52F-70-BW Stratofortress drops Mk 117 750 lb (340 kg) bombs over Vietnam, circa 1965-1966. 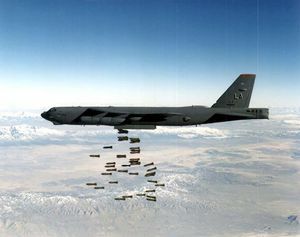 With the exception of the 11-day Operation Linebacker II attacks against North Vietnam in 1972, the B-52 bombers, designed for strategic nuclear attacks on Soviet and Chinese targets, principally operated in a tactical support role of mass bombing in South Vietnam. 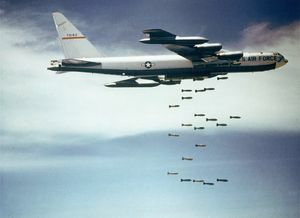 Other than the Linebacker campaign, the strategic bombing campaign against North Vietnam was carried out by Air Force and Navy fighter-bombers, designed as tactical aircraft. Under the code name of ARC LIGHT, B-52s flew missions over suspected enemy areas, each B-52 typically dropping 42,000 pounds of conventional explosives. They bombed from high altitude, out of sight and hearing, so the first warning of the actual attack would be exploding bombs. Poor U.S. communications security, as well as Soviet intelligence ships in international waters near the main base in Guam, would give a general warning that an attack was on the way, but not where. While ARC LIGHT attacks were most common in South Vietnam, ground-controlled attack, precision for its time, began in July 1966. With the "combat sky spot" radar system, a ground controller could direct the bomber to release its payload over a specific spot designated by the supported troops. This allowed their use against targets of opportunity discovered while they were en route, especially significant given that the enemy tended to know strikes were coming, and occasionally the general area. This capability was used in close support at the Battle of Khe Sanh in 1967. "Bugle Spot", a refinement of "Combat Skyspot", established pre-surveyed target boxes in the Khe Sanh area, where bombs could be dropped on call. The defenders found that the B-52 strikes had a major effect against North Vietnamese trenches and underground installations moving closer to the perimeter, with the bombs setting off sympathetic detonations of enemy ammunition. Every three hours, six B-52s would arrive over Khe Sanh, to be directed to the target area judged most important at the time of arrival. By the end of the battle, 2,548 B-52 sorties had dropped 59,542 tons of bombs, turning the area around the base into something resembling the cratered surface of the Moon. A B-52 delivering large numbers of "dumb" bombs. On what was to be the longest bombing mission in history,  B-52 bombers took off in the wee hours of the morning, for a 14.5 hour flight to the unmarked point in the sky, from which they would launch then-secret AGM-86C conventional air-launched cruise missiles, known by their crews as "Secret Squirrels", at targets in the Baghdad area. This strike was somewhat controversial, with critics claiming the Air Force flew a needlessly difficult mission to hit eight targets, including power plants at Mosul and a telephone exchange in Basra. In response, Air Force commanders pointed out that this long-range capability was available had a response been needed as soon as the Iraqis invaded Kuwait, when little else could have gotten quickly into position, yet not jeopardized crews flying into the teeth of the Iraqi integrated air defense system (called KARI). On the next day, drop more leaflets essentially saying "We kept our word. Save your lives." In its present role, the B-52H flies at high altitude (up to 50,000 feet) and high subsonic speed, generally over areas where the air defenses are nonexistent or have been suppressed. 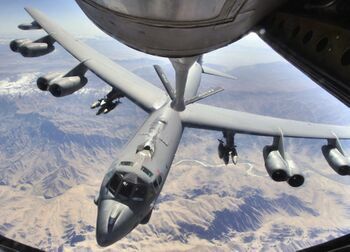 B-52's can perform strike with standoff weapons, battlefield air interdiction, offensive counter-air against enemy air facilities, and deliver precision-guided munitions in close air support. While B-52s are counted as nuclear delivery systems under arms control treaties, their limited ability to penetrate limits them to a rule as cruise missile carriers with nuclear-armed AGM-86 ALCM weapons. They are organized into two active wings, one at Barksdale Air Force Base, Louisiana, and the other at Minot Air Force Base, North Dakota. The Air Force Reserve Command also has a wing at Barksdale, which is also home to their controlling headquarters, the Eighth Air Force. It can complement purpose-built maritime patrol aircraft such as the P-3 Orion, BaE Systems Nimrod, and Tu-142 BEAR, and provide ocean surveillance, anti-shipping warfare, and lay naval mines. Two B-52s, in two hours, can monitor 140,000 square miles (364,000 square kilometers) of ocean surface. The B-52, however, does not have surveillance sensors comparable to those on specialized aircraft, although there have been recent improvements. Special operations teams in Afghanistan routinely directed B-52 attacks, on nearby targets, by providing target coordinates for Joint Direct Attack Munitions (JDAM). This was informally described as having a "2,000 pound hand grenade" available, quickly, to small forces. With JDAM, it is possible for a B-52 to strike numerous independent tactical targets in the same mission. The GBU-39 Small Diameter Bomb equipped with JDAM is part of that evolution; one does not need or want a 2,000 pound bomb if a 250 pound bomb can hit very near the target. Another enhancement was the addition of the AN/AAQ-28 LITENING electro-optical imagery and aiming pod. This allows the B-52 not only to designate targets for precision-guided munitions, but to transmit imagery outside the aircraft. In addition to tactical cooperation, image transmission makes the B-52 more useful as a surveillance platform. Communications include the UHF AN/ARC-164 SINCGARS and AN/ARC-210 SATCOM; AN/ARC-190 and AN/ARC-310 HF; FAB-T EHF SATCOM. Current B-52H aircraft carry all munitions in the internal bomb bay, although other models have variously carried air-to-surface missiles, decoys, or racks for additional conventional bombs on the wings. The B-52H, with a weapons payload of more than 70,000lb, is capable of carrying the most diverse range of nuclear and non-nuclear weapons of any combat aircraft. The conventional weapons payload is some combination of four AGM-142 Raptor missiles, 20 AGM-86 Air Launched Cruise Missiles (ALCM), 12 AGM-154 Joint Standoff Weapons (JSOW), 12 Joint Direct Attack Munitions (JDAM) and 16 Wind-Corrected Munitions Dispenser (WCMD). WCMD was first deployed by the B-52 in 2002 in Afghanistan. JSOW entered service in 2003 and was deployed during Operation Iraqi Freedom. While early B-52 aircraft were equipped with radar-controlled 20mm autocannon in the tail, all defensive equipment is now for electronic warfare, including defense against heat-seeking missiles. 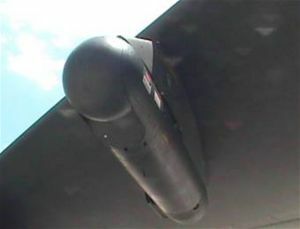 The B-52 has used a variey of deceptive decoys. B-52s of the 1960s carried up to 8 ADM-20 Quail free-flying decoys in its bomb bay. This page was last modified 18:29, 5 March 2013.